"Thermalright presents the Silver Arrow TR4, a high-performance special edition of the innovative Silver Arrow IB-E, designed exclusively for AMD's new Threadripper-CPUs. More power, less size. By mounting the TY 143 PWM-fan centrally between the two cooling towers, Thermalright manages to maximise the cooling capacity while minimising the space requirements of the cooler. With unrestricted access to the RAM and the upper PCIe slot, it also does not protrude beyond the standard ATX motherboards. Even at its maximum fan speed of 2,500 rpm, the Silver Arrow TR4 operates at similar sound levels as comparable compact watercooling solutions with identical settings. The extremely wide control range of the fan from approx. 600 to 2,500 rpm also allows comparatively quiet operation under normal load. The new Silver Arrow TR4 with its maximum cooling power of up to 320 Watt has sufficient power reserves, even for the 2nd generation of AMD's Threadripper-CPUs. The significantly larger, high-gloss nickel-plated base plate meets the requirements of the current and upcoming AMD CPUs. 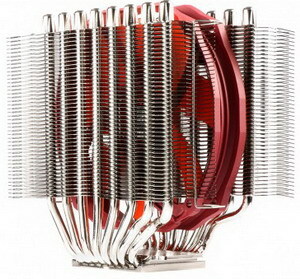 The Silver Arrow TR4 is a cooler of the highest quality for CPUs of the high-end class. Please note that the Silver Arrow TR4 is designed for the AMD Threadripper CPU Socket TR4 only. "